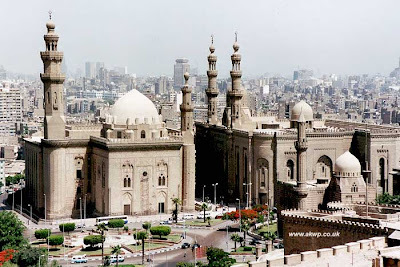 This is one of the most beautiful and monumental mosques in Cairo. The builder of this mosque and school was Sultan El Nasser Hassan. He was the 19th of the Turkish Sultans to have reigned in Egypt and the seventh son of the Sultan El Nasser Mohamed Ibn Kalaoun. Conspiracies were one of his era’s traits. 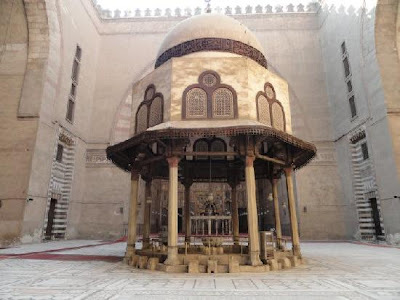 He decided to build his mosque in the square facing the Citadel of Salah El Din. He began the construction in 1356 and it was completed in the year 1363 by Bashir Agha who was one of his princes. This mosque is considered one of the greatest works of Islamic architecture. The mosque is 7907 square meters wide. The entrance is 37.80 m high. There is also a schoool or a madrassa mosque for the four rites of Islam. The court is almost a square in shape. Each side is about 32 meters in length. On each side there is an wan that stands higher than the court. Each wan is roofed with a brick-pointed tunnel-vault with a stone arch. Art lovers consider the arches of its largest wan a miracle of construction. The walls of the Iwan are covered with coloured stone blocks and marble. 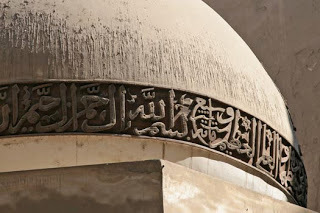 There is a stucco inscription containing verses from Surat El Fath in Kufic writing. In the middle of the wan there is a marble pulpit and tribune of great craftsmanship. Around the mihrab there are four marble supports. On the right side of the minbar, which is made of white marble, there is a wooden door covered with bronze. At each side of the qibla wall there is a door. The two doors lead to the tomb chamber. The doors were covered with bronze and gold silver inlay. The tomb chamber is 21 square meters high. The walls are covered with marble up to 8 meters. The Mosque of Sultan Hassan has two minarets. One is 82 meters high and is considered one of the highest Islamic minarets. It is two meters shorter than the two minarets of Mohamed Ali Pasha Mosque which was built 500 years later.